You may feel like something is bugging you but you don’t know what it is. You might be feeling upbeat and able to face the challenges of life, but there’s something that you cannot put into words that’s annoying you. The obvious solution? Try putting it into words. 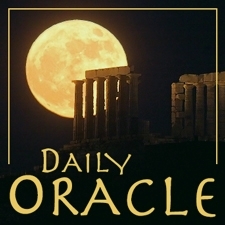 Today’s Oracle takes us to the Capricorn weekly for Feb. 12, 2015. You may feel like something is bugging you but you don’t know what it is. You might be feeling upbeat and able to face the challenges of life, but there’s something that you cannot put into words that’s annoying you. The obvious solution? Try putting it into words. You might not be able to fit it into five words or a page, but if you do The Artist’s Way morning pages routine for a week or so, you will learn a lot. That means writing out three pages as early in the day as you can, and setting the pages aside. After about a week, read them over and see what you’ve got. It’s likely you will have figured out your little thing long before that, and will have discovered that it is, indeed, rather small. But it may give you a big clue to cultivating future happiness.